Copenhagenize.com - Bicycle Urbanism by Design: 1726 New Car Parking Spots in Copenhagen ?!?!? 1726 New Car Parking Spots in Copenhagen ?!?!? Here's the biggest FAIL of the year so far from Copenhagen's politicians. It was agreed the other day to spend 161 million kroner [€21 million / $30 million] to establish 1726 new parking spaces for cars. 1726. Parking spaces. For cars. In Copenhagen. Not 1700 but 1726. 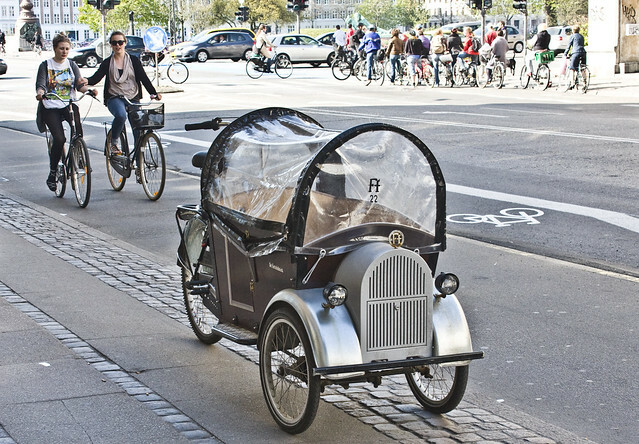 We've be highlighting for quite a while now here on Copenhagenize how Denmark and Copenhagen are becoming increasingly car-centric. At the expense of cyclists, pedestrians and transit-users. Mind-boggling, I know. Even more mind-boggling is that the Lord Mayor, Frank Jensen, rallied a majority in the city council to vote for it. Not, however, the mayor for the Traffic and Environmental Administration (Dept of Transport), Ayfer Baykal. She walked out of the negotiations. "We are spokesmen for cyclists, the collective traffic and pedestrians. We prioritise quality sidewalks, wider cycle tracks, more trees on the streets and green city spaces instead of more asphalt and loads of cars in the streets", she said. At least we have some sensible politicans left after Klaus Bondam left the bicycle scene. "Copenhagen is a modern, green metropolis where we prioritise collective traffic and bicycles very, very high. 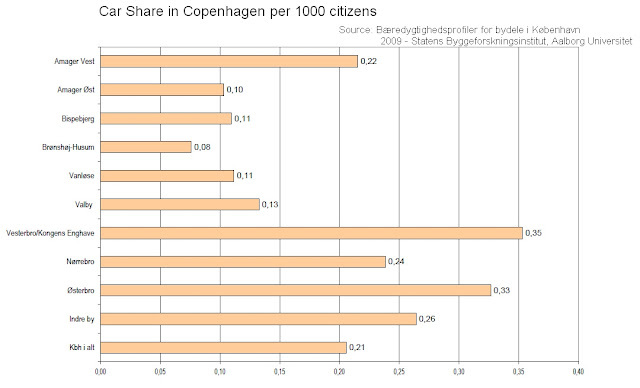 But there should also be space for those Copenhageners who have a car. With this vote we ensure a bit better conditions for them and create a framework for the city's growth." Boy, he makes it sound like a lot of people have cars in Copenhagen. So who, exactly, are these parking spots for? 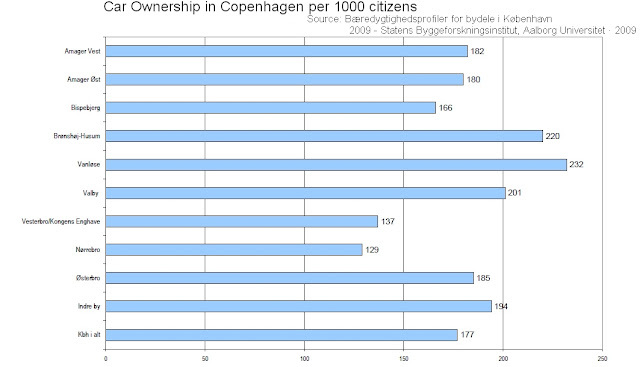 Because car ownership is, on average, only 17.7% in Copenhagen Municipality. 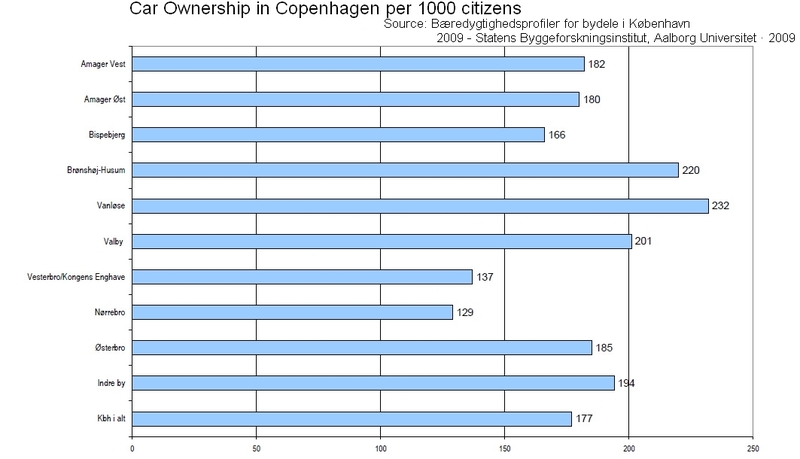 The neighbourhood with the lowest car ownership is Nørrebro, at 12.9%. Vanløse has the highest at 23.2%. 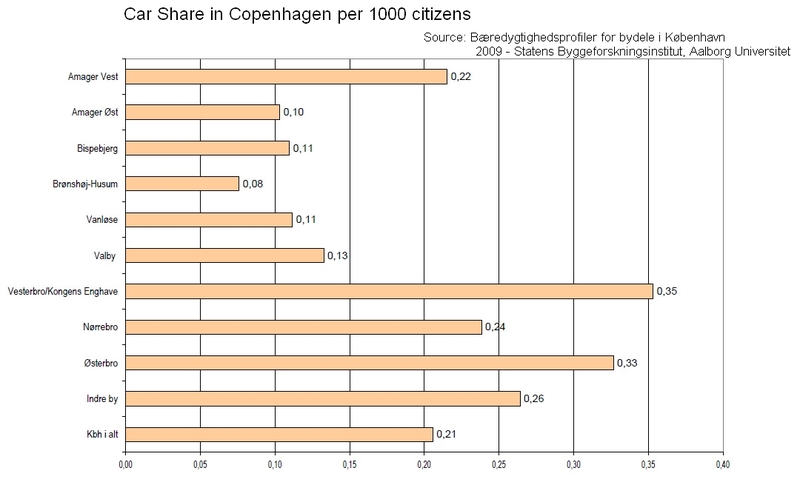 Even if you measure by household, rather than by individual, and include company owned cars also operated for private use, the household average for 2010 is 28.1% in Copenhagen Municipality. And we're spending 161 million on a tiny minority? That money could be used for 20 km of cycle tracks! Former mayor in charge of traffic Bo Asmus - who is now gone - proposed investing in electric cars last year despite Copenhageners saying that they would rather have more and better bicycle lanes. Now, once again, the majority is not being heard. We spending money on something that isn't there and isn't needed. Ironic that the Lord Mayor was splashed all over CNN recently about how fabulous and green Copenhagen is and then he pushes for this vote. So, what's the alternative? Apart from listening to the wishes of Copenhageners and betting on bicycle traffic and public transport? There are several. One is pushing the plan for a proper bike share system forward. Then there is this one. Car share. Here's an article about the programme I subscribe to. The car share companies wanted car sharing to be integrated in the parking strategy in city hall. They've done their homework, too. Shame it was ignored by Frank Jensen and his cronies. - There are currently 150 car share vehicles in Copenhagen. 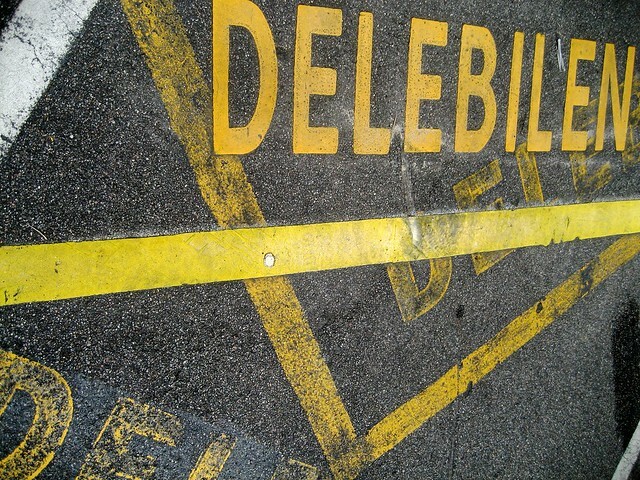 They have made 600 parking spots redundant. - There would be 2400 few cars in the city if the number of car share vehicles rose to 600. 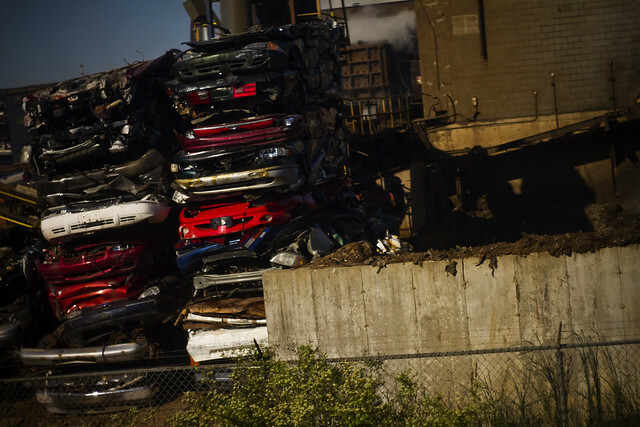 - 2400 fewer cars frees up 2400 parking spots - which is 60,000 square metres of urban space. - This is would reduce car traffic by 45,000,000 kilometres a year. - With a reduction of 10,500 of C02 each year. - And an increase of 1,600,000 passengers a year on public transport. - Not to mention an increase in cycling. 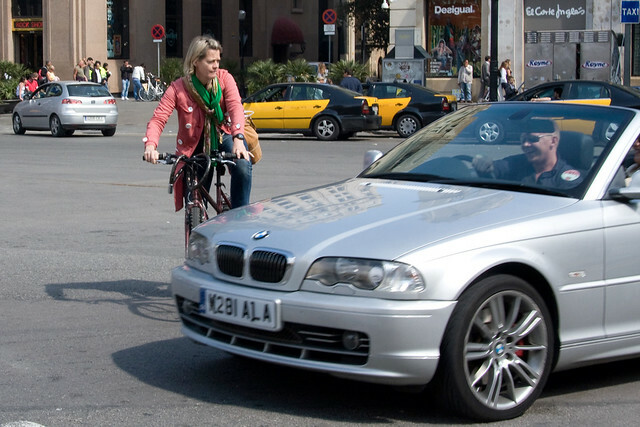 Where is the polictical support for car sharing? It would cost a fraction of the price of 1726 new parking spots. It's a clear cut solution with immediate and noticeable positive effects. It's cheap. It's practical. It's a solution tha reflects the reality that few people actually own cars. It's traffic planning for morons. Another FAIL from Frank Jensen recently was his proposal for parking tickets for bicycles. Here's an article about his 'vision' in a Danish newspaper. I asked the head of the Bicycle Office in Copenhagen, Andreas Røhl, what he thought about this idea. He thought about it for a moment while formulating a fitting, diplomatic answer. "This is not the kind of policy we usually work with". My god, this is all so amazing. You've all been reading along on the blog for a while, seeing the best of what we do here in Copenhagen. Now you get to be a witness to how we are picking it all apart. Parking for cars. Bicycle helmet promotion. Money taken away from bicycle infrastructure. Please learn from our mistakes. Please take away the good and use it wisely, but make sure you let Frank Jensen and politicians like him show you how NOT to build a green city. Thanks to Miljøpunkt Amager and Lars Barfred and Rasmus for the links.